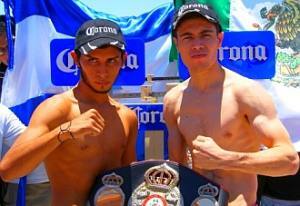 WBA Interim Bantamweight Champion Hugo "Cuatito" Ruiz of Los Mochis, Sinaloa México (right) is set to make the fourth title defense of his black & gold belt against Nicaragua's Jean Sampson tomorrow in La Paz, Baja California and both warriors have successfully made their weights: Ruiz weighed in 117 lbs (53,20 Kgs), while Sampson recorded 118 lbs (53,500 kgs), the limit of the bantamweight division. Interim king Hugo "Cuatito" Ruiz's is one of the toughest sluggers in the 118 pounds division, whose elder brother Heriberto "Cuate" Ruiz came to the Philippines and lost to Boholaño Rey "Boom Boom" Bautista last year at the Waterfront Hotel & Resort in Cebu. On the other hand, challenger Jean Samspon (12-1, 7KOs) arrives to the most important match of his life with a controversial win over former world champion Rosendo Alvarez. That fight was Alvarez's return to the ring after six years of retirement. Regardless of age, the veteran 42-year-old Alvarez was dominating Jean Sampson, 22, in their native Nicaragua. But all the sudden Alvarez got sent off to the shower rooms for verbally offending the third man Sr. Onofre Ramirez. Prior to his strange rumble with Rosendo Alvarez, Jean Sampson had lost by points to Colombia's Yonfrez Parejo in Panama. Incidentally, the third title defense of Hugo "Cuatito" Ruiz (30-1, 27KO's), was with Yonfrez Parejo whom the Mexican destroyed in eight rounds in Los Cabos, B.C. Due to these series of results, fans and boxing analysts give very little chance to Jean Sampson, the rated # 15 in the WBA, to capture the WBA interim title tomorrow. "Only a miracle would make Nicaragua's Jean Sampson dethrone the powerful hard hitting Los Mochis world champion Higo "Cuatito" Ruiz." The neutral WBA officials for the Ruiz-Sampson clash are: referee Raul Caiz Sr of California; judges Levi Martinez of New Mexico; Rafael Ramos of Texas by way of Puerto Rico, and Jason Garcia also from Texas. Should Hugo "Cuatito" Ruiz, 25, retains his WBA interim bantamweight title, next he might battle the regular WBA bantamweight regular champ Japan's Koki Kameda or the WBA bantamweight "super" world champion Anselmo "Chemito" Moreno (33-1-1, 12KO's) of Panama. WBA # 3 John Mark Apolinario (17-2-1, 4KO's) of Maasim, Sarangani, and WBA # 6 Malcolm Tunacao (30-2-3, 19KO's) of Kobe, Japan by way of Mandaue City, Cebu.